Two separate serious car crashes shut the A47 in Peterborough this morning, Tuesday, causing very long delays. The road was closed on A47 the Soke Parkway westbound between the A15 and Junction 16 Bretton Gate. 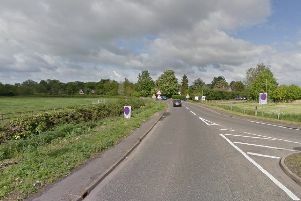 Police reported two separate accidents in the area, one by the Gresley Way turning, the second less than 100 yards to the Bourges Boulevard turn off. There are reports that the accidents are due to a large fire on Ivatt Way that is causing a large amount of smoke to billow across the carriageway. The A47 Soke Parkway has now reopened as of 8.40AM, but residual delays remain with traffic queuing back past the Eye Green turning on the A47, as well as along the A16, as well as along Lincoln Road and Werrington Parkway. Ivatt Way remains closed while fire crews tackle the blaze.